Diamond Custom Homes has added a new Superintendent to the team: Michael (Mike) Locke. Locke was born and raised in the Boston area but made the move down to Naples with his family in September of 2005. Before beginning his career, Locke served in the United States Navy during the 80’s, primarily stationed on an aircraft carrier that sailed around the Indian Ocean and Mediterranean Sea. He completed boot camp in Orlando and was initially stationed outside Jacksonville, so he’s no stranger to the Sunshine State. Prior to working at Diamond Custom Homes, Mike and held various positions in the home building industry and even managed his own home watch and home maintenance company called Locke Home Services for over eight years. Starting in May 2018, Locke accepted a position as superintendent for Diamond Custom Homes. He works in the remodeling division of DCH, and is currently overseeing three home constructions, two major reconstructions in Naples. As superintendent, he is involved in all aspects of an estate’s build from planning through completion including managing subcontractors and obtaining work permits. He ensures work is proceeding on schedule and within budget. When asked what he enjoys most about working with Diamond Custom Homes, Locke replied, “the work environment, hands down. It’s great being part of a company that delivers such high quality work. I’ve really enjoyed the transition from corporate to private construction because there is greater opportunity to build relationships with clients and truly understand what they want”, he added. 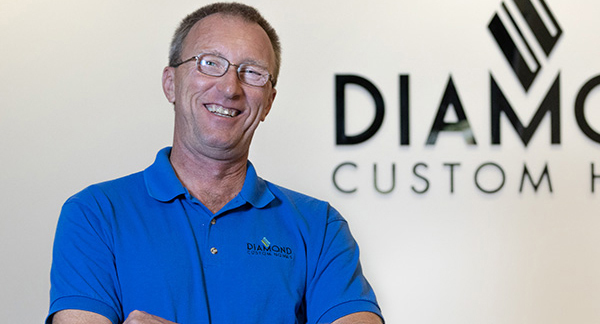 Michael Diamond, president of Diamond Custom Homes, is thrilled to be adding another Superintendent to the team. “We are lucky to have someone with such a diverse background join the DCH team. Mike will bring a unique perspective to the remodeling,” said Diamond. When not managing a construction site, Locke enjoys spending time with his parents who recently relocated to Naples, his three children, and his five grandchildren. Spending free time four wheeling and motorcycling with his grandchildren, his family certainly keeps him busy.